I hope my coffee blog was informative and that you are clearing your mind from those ridiculous, made up CHINO coffee recipes, which are preventing you from being considered as a true Italian. ADESSO – now – it is seriously time to take notes. The word literally means “express” i.e. quick, due to the method of preparation and I would personally add, due to the speed of drinking it. Don’t sip it for too long. Just drink it up and have a glass of water after that! Ristretto literally means “concentrated”. 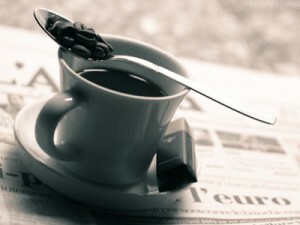 It is a very strong concentrated coffee and that is why we stop the machine just before the normal time. So…”Poco ma buono” we say – little but good. Corretto literally means “corrected” in the sense that the coffee gets “corrected” or “ adjusted” with a drizzle of liquor, normally grappa to give you wings – better than the red bull wings! I have talked about it in my previous blog but just in case you forgot, it is a coffee with milk and foam. Remember the spelling of this word, with two C and two P.
Macchiato literally means “stained”. That is what we, poetically, do to the coffee, we “stain” it with cold – freddo – or hot – caldo – milk. Lungo literally means “long” so it’s a weak coffee, watered down for those who want to sip, talk, watch and never leave the table. It is the American intervention in the caffè lungo. They probably couldn’t pronounce it and they changed the name to make it theirs. Shall we serve it with the American flag? That’s what you get when Italian meets English. What can I say? It is an espresso, mixed with sugar and lots of ice, vigorously shaken until the foam is formed on top. It is a “cool” option for summer time. Vetro means glass in Italian so it is a coffee served in a glass…very glassy…I mean classy! Tavolo means table. So if you have your coffee served at the table, you need to know you will have to pay more for the service but you can sit for as long as you wish.